August 15th, 2012: For the first time in the US, the man who filled the streets with rage, the legend who raised the act of video game music; Yuzo Koshiro will make his long awaited appearance at MAGFest 11. 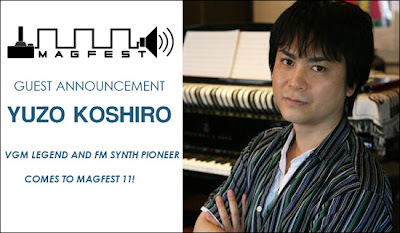 An industry legend and pioneer of the FM synthesizer, Koshiro has long been one of the most well respected and admired video game composers in the entire world with his incredibly energetic and dance friendly style of music, contrasted by his grand orchestral masterpieces, making him one of the most versatile and diverse composers of all time. After studying under the tutelage of Joe Hisaishi, Koshiro made his mark as part of the JDK unit for Falcom's groundbreaking action RPG games, most notably Ys. He then went from Falcom to SEGA, where he would create the soundtracks that ultimately became his most popular; Shinobi and Streets of Rage. In 1990, Koshiro composed the music for Enix's Actraiser, a soundtrack that redefined orchestral sound in a video game, and became one of the most popular soundtracks on the Super Nintendo. Since the creation of his family run company ANCIENT in that same year, Yuzo Koshiro has continued to compose for video games for close to 2 decades, with games including Shenmue, Castlevania: Potrait of Ruin, and Etrian Odyssey. Koshiro will take part in a rare not-to-miss panel and Q&A, telling the story of his career and allowing the fans to ask the questions they want answered. In addition to that, he will also have a full DJ set featuring his own video game music! That's right, as Yuzo Koshiro makes his debut on US soil, you will be soiling your pants dancing to the sounds of Streets of Rage, Shinobi and other classic surprises DJ'd by the legend himself. It has been a long awaited and often requested name, and we at MAGFest are honored and excited to finally say; Yuzo Koshiro will be at MAGFest! Yuzo Koshiro is my hero. He's up there with ... whoever did the Contra Hard Corps and the Journey to Silius soundtracks as being the best video game musician ever... I know most people don't agree, but STREETS OF RAGE 3's ost is my favorite... it's very experimental and odd, often abrasive, but just completely warped in a really interesting way. This dude is a genius. I'm so down to go to this it isn't even funny. No other composer would get me this pumped!